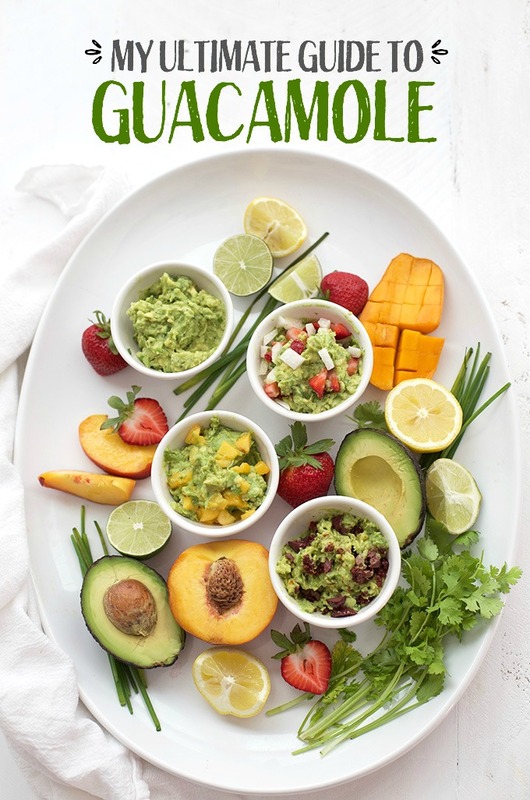 Whether you’re a purist or an experimenter, you’ll love this ultimate guide to guacamole. It’s a simple method you can use for the classic guacamole, plus MANY different variations you can try to keep things interesting. Some people are guacamole purists. In their eyes, the ONLY acceptable ingredients in guacamole are avocado, lime juice, cilantro, red onion, and jalapeño. Period. Some people like to get crazy and add all sort of things (caramelized onions, charred corn, green chiles, tomatoes, etc.) until it’s almost a giant mashed avocado salad of sorts. And it’s really, REALLY fun to experiment. So, today I’ve got my favorite basic recipe, plus a handful of ways you can change things up to keep it interesting. Gaby Dalkin of What’s Gaby Cooking (who literally wrote the book on avocados) has majorly changed my guacamole game in the last year. She converted me to chives instead of red onion. I’m already a little raw onion averse, but there are few things that make a dining experience worse than dipping your chip into salsa or guacamole only to discover that you have now been transformed into an onion. Even if you’ve only taken one bite of too-onion-y salsa or guacamole, that onion breath aura will follow you around for the rest of the evening. It’s really hard to overdo the onion element with chives. They’re mild, less “spicy,” and they can be minced so small that they blend right in with the cilantro and avocados. Basically, The Onion Cloud will be much less likely to follow you around with chives. As for the citrus element, Gaby also converted me to half-lemon juice, half-lime juice. It tastes a little brighter and more complex than just lime juice (though heaven knows, I love lime juice), and it’s a little more flexible for other add-in ingredients. I’ve gotten my amounts just where I like them, and it makes for such an easy guacamole recipe that (other than the mincing), Sophie (my 5 year old) can make it by herself. She calls it her Famous Guacamole. Mix and match! Experiment and try different combinations. There are so many possibilities! STORAGE: There are 1001 methods for keeping guacamole from oxidizing (browning). 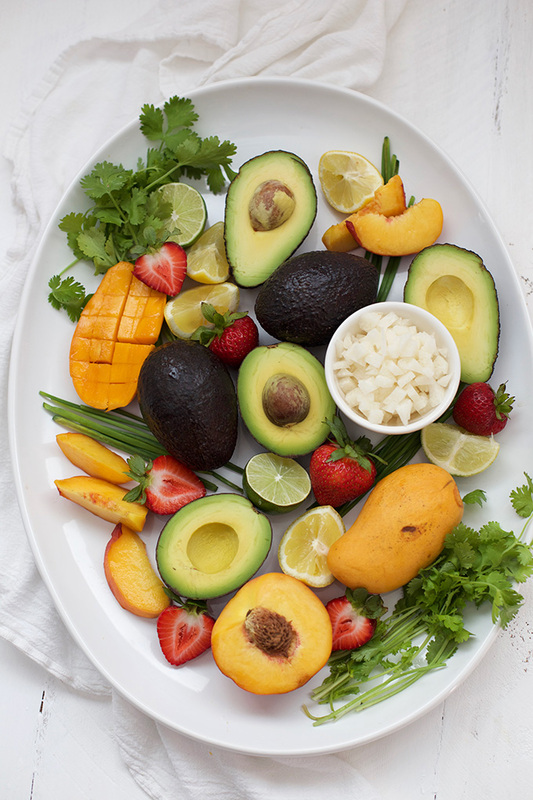 My favorite is to include plenty of citrus juice, and to press plastic wrap down as tight as possible on the surface of the guacamole. The less air and the more citrus juice, the better! This recipe has plenty, but if you’re nervous, add an extra squeeze of lemon or lime juice before storing. It will only keep for about 2 days. FREEZING. Yes, you can freeze guacamole. It’s the best! I often buy bags of avocados from Costco and they all magically ripen at the exact same moment. Rather than let any go to waste, I’ll make a few batches of guacamole, transfer them to airtight zip-top bags, press out any extra air and freeze them. They’ll keep in the freezer about 2 months. You’ll also need to stir the guacamole a little when it thaws, since it may slightly separate. WHEN IT COMES TO HEAT… I live with two tiny people have Z-E-R-O heat tolerance and can detect when I’m even thinking about adding jalapeño to things. If you and your people can do heat, add a little jalapeño! It’s awesome! 2–4 Tbsp of your favorite add-ins. See the notes for some ideas! On a plate, mash avocados until no large lumps remain. Squeeze lemon and lime juice over avocado mash and stir to coat. Stir in chives and cilantro, and any add-ins that sound good to you. Add salt and pepper, to taste. Our favorite guacamole add-ins. 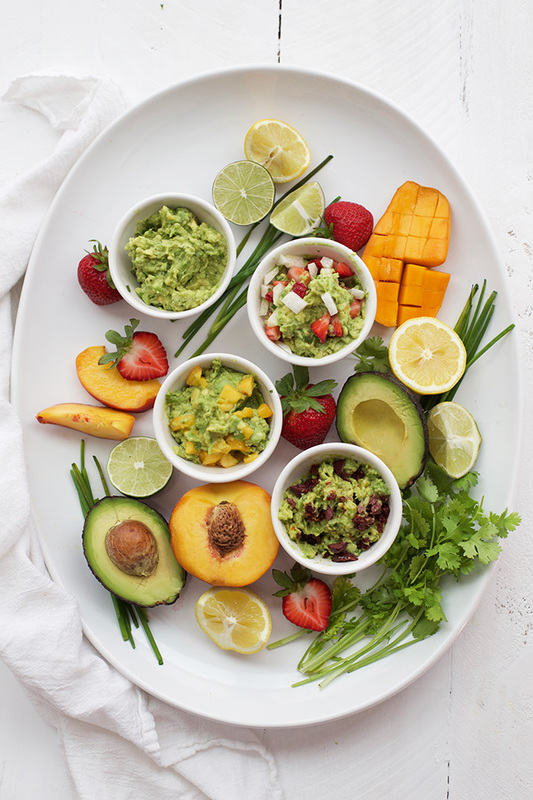 Choose 2-4 Tbsp of 1-2 different add-ins to create your own delicious guacamole combinations. This post plus that video are the things dreams are made of. LOVE! I add Garlic Powder and Lemon Pepper…. Adds so much flavor! YUM! I’ve never thought to add lemon pepper, but I LOVE it! I bet it would be awesome in guacamole! Thanks for the tip!